This entry was posted in Digital Artwork, iPad Art, Sketches and tagged #AtAnyRate, #ItIsWhatItIs, context, Corner, hermeneutics, Paper 53, Paper by Fifty Three by portfoliolongo.com. Bookmark the permalink. It is what it is except when it isn’t. A recent New York Times Magazine (4/5/15)talked about these tail chasing tautophrases. They “preserve and burnish” established orders. Así es. Ni modos. The initial idea for the accompanying image was a circle of spectators all of whom are looking at the very same thing, some object, but each from a different perspective and, accordingly everyone’s seeing something different because each is looking at it differently. Now that would have taken a lot of detail, a lot of characters with a lot of different “thought bubbles” full of even more differences. 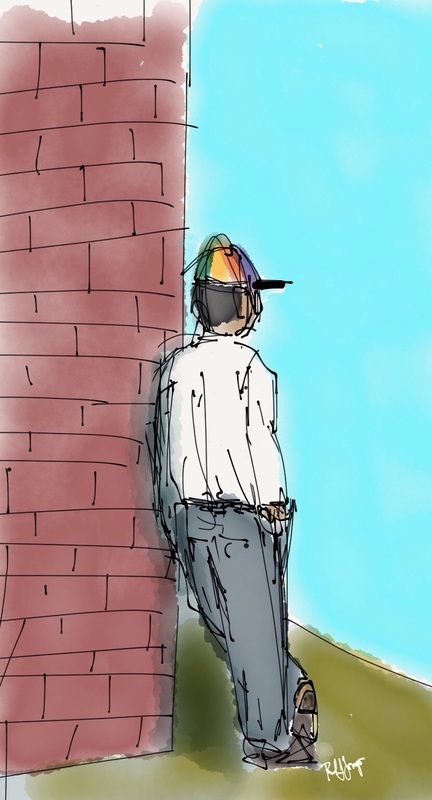 Instead I went with the dude leaning against the wall facing the wide blue yonder and looking at either the emptiness or fullness of nothing, which can also be approached in more ways than one. Compulsive sense making.